Many countries and international organizations started spacecraft programs to explore the Moon. They include the European Space Agency (ESA), Japan, China, the United States and Russia. 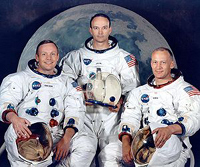 « The Apollo 11 crew from left to right: Neil Armstrong, Michael Collins, and Edwin Aldrin. The Apollo 11 space flight landed the first humans on Earth's Moon on July 20, 1969 by the United States . Launched from Florida , the third lunar mission of NASA's Apollo program was crewed by Commander Neil Alden Armstrong, Command Module Pilot Michael Collins, and Lunar Module Pilot Edwin Eugene Aldrin, Jr. On July 20, Armstrong and Aldrin landed in the Sea of Tranquility and became the first humans to walk on the Moon. Their landing craft, Eagle , spent 21 hours and 31 minutes on the lunar surface while Collins orbited above in the command ship, Columbia . The three astronauts returned to Earth with 47.5 pounds (21.55 kilograms) of lunar rocks and landed in the Pacific Ocean on July 24. ESA launched SMART-1 in 2003. "SMART" stands for Small Missions for Advanced Research in Technology. 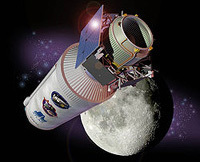 SMART-1 impacted the Moon's surface as planned, on September 3, 2006 at 05:42:22 UTC, ending its mission. Moving at approximately 2,000 m/s (4,500 mph), SMART-1 created an impact visible with ground telescopes from Earth. It is hoped that not only will this provide some data simulating a meteor impact, but also that it might expose materials in the ground, like water ice, to spectroscopic analysis. Japan launched SELENE (Se enological and Engineering Explorer, Nickname – Kaguya) in September 2007. It was the second Japanese lunar orbiter spacecraft. SELENE was produced by the Institute of Space and Astronautical Science (ISAS) and the National Space Development Agency (NASDA). After successfully orbiting the moon for 1 year and 8 months, the main orbiter was intentionally crashed onto the lunar surface near Gill lunar crater at 18:25 UTC on June 10, 2009. China launched Chang'e-1 in October 2007 from Xichang Satellite Launch Center . It left lunar transfer orbit on 31 October and entered lunar orbit on 5 November. 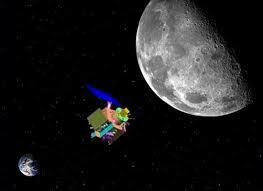 The first picture of the Moon was relayed on 26 November 2007. On 12 November 2008, a map of the entire lunar surface was released. Data gather by Chang'e 1 was able to create most accurate and highest resolution 3-D map ever created of the lunar surface. Its sister orbital probe Chang'e 2 was launched on the first of October 2010. India launched Chandrayaan-1 in October 2008 from Satish Dhawan Space Centre, Sriharikota. The lunar mission carries five ISRO payloads and six payloads from other space agencies including NASA, ESA, and the Bulgarian Aerospace Agency, which were carried free of cost. The cost of Chandrayaan-1 mission was about Indian Rupees 386 crore (about US $80 million). 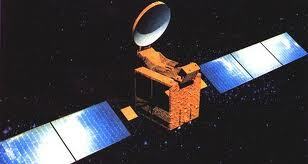 It carried high resolution remote sensing equipment for visible, near infrared, and soft and hard X-ray frequencies. Over a two-year period, it was intended to survey the lunar surface to produce a complete map of its chemical characteristics and three-dimensional topography. The Polar Regions are of special interest as they might contain ice. 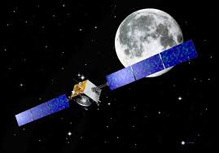 In June 18, 2009, The US launched Lunar Reconnaissance Orbiter (LRO) as well as Lunar Crater Observation and Sensing Satellite (LCROSS). LRO is designed to map the lunar surface and characterize landing sites for future missions. Moving at a speed of more than 1.5 miles per second, the Centaur upper stage hit the lunar surface shortly after 4:31 a.m. PDT on October 9, 2009. It was a robotic spacecraft operated by NASA. The main LCROSS mission objective was to explore the presence of water ice in a permanently shadowed crater near a lunar polar region. It was successful in discovering water in the southern lunar crater Cabeus. All these Spacecraft sought to find answers too many interesting questions about the moon that haunt the humanity even today.